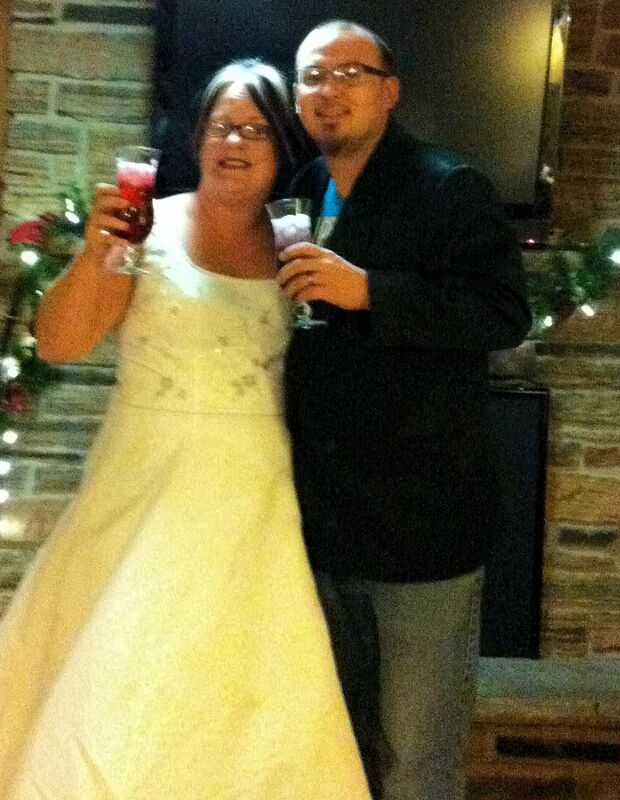 2012 has officially arrived and hubby and I rang out the New Year with mocktails in our finest gear. A girl deserves to wear her wedding dress more than once! With this new year many of us have reflected on the previous year and resolved to make changes in 2012. In this process we often set our sights too high and fail with these resolutions. Where we lose footing is by becoming caught up in everyday life and losing focus. Believe me when I say that I have experienced this, so many times I resolved to stop drinking or lose weight on Jan. 1 only to find that I’m off track soon after. I have the key to success now, I’ve proven it to myself over the past 22 months and I now intend to implement this strategy in another area of my life. The key is quite simple really, it’s a philosophy which has been adopted by the most successful recovery programs around the world and is explained in one succinct, short sentence. That’s it, there’s the secret miracle which has changed my life. In the early days of my recovery thoughts of spending my ENTIRE life without alcohol scared me to death. My past drunken behaviors and the hurt I caused felt like a huge mountain which I couldn’t face. Imagine knowing that you’ve hurt people with your actions….and then imagine that you’ve been numbing your emotions for years with alcohol and won’t have that buffer anymore….it’s bloody frightening! Sobriety looked unachievable from my vantage point but somehow I realized I had to try. My desperation and fear of where my life was heading surpassed my fears. I reached out for help and found it! God led me to my 12 step program and the people within it, through these people and the program I learned how to exist through the horrible discomfort of new sobriety. Eventually over time the discomfort has receded. I have learned to accept the past and leave it where it belongs, only visiting it to learn and to make amends. I don’t dwell nor do I worry about the future which hasn’t happened. I trust that God will guide me and ensure I have learned the tools along my journey to cope with any situation as it arises, it’s my responsibility to be aware of my emotions and remember not to become lost within my own mind. I have many plans for 2012, including remaining sober, continuing with my recovery from the car accident, writing more and working to become healthier. I vow to get 20 minutes of exercise a day irrelevant of the physical pain, by not moving I am not helping reduce my pain. I also vow to eat in a healthy manner, minimally eating 3 times a day planned meals and drinking 8 glasses of water a day. Currently I do not have a natural hunger urge because of the brain injury and I must keep track of eating and ensure I am supplying my body with nutritious fuels. That’s it, this is doable if I keep a log and a focus upon these goals. I’m incorporating my One Day at a Time philosophy and am intent that I will succeed! 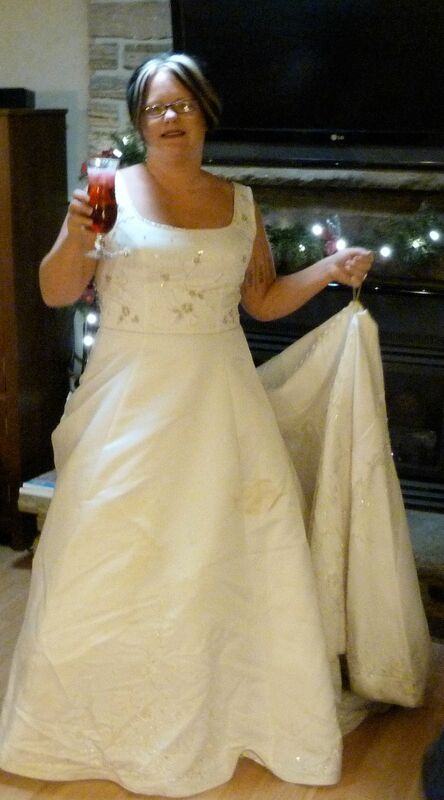 Wearing my 9.5yr old wedding dress was so much fun and I look fabulous don’t I? That is as long as I’m facing you….. This is a great before photo in my eyes! Next time I put this dress on I want it to fit like a paper bag! Bring it 2012, I’m ready to achieve!!! Love that you wore your dress, have a fantastic 2012 – it’s great to know you! Thanks Tammi, I think you’re amazing! I appreciate your goals (and I love your tattoos!). I think you’ve provided some great insights that I’m going to take on board. Thank you! So happy for your exciting news Nancy! You look beautiful Julie! You will achieve all of your goals for the new year! I know it. With the help of my weekly updates I think I will! You look fabulous! Great tatts. Your One day at a time philosophy is a great one that I think we all could use. Here’s to a great 2012!! that’s awesome Julie :) Happy new year hon! How did I know you’d enjoy the humor there Laurel ???? All the best for 2012 my love. Sorry I had you fooled Lynette! I’m very glad I’m not alone Shan! Oh sweetness, what a wonderful post … I love reading your blog for the sheer honesty and openness you bring to your bloghome … you are an inspiration and a blessing. I look forward to reading more from you in 2012, you inspire me! 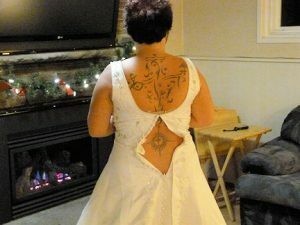 oohhh now I want to put on my wedding dress and so brave of you to show the back view! ha! I would have let you all believe it fit perfectly hehehehee good luck and best wishes for 2012! Well Jennifer that’s how I used to roll, now my world is different even when it’s uncomfortable! You are so awesome, Julie! I big, fat, fuzzy heart you! All the very best to you and your family! May 2012 be a fabulous one! Christine I think we were destined to meet and one day I’ll have you dancing on a table! ROFL I love you. I love how you make me whistful in one second, then laughing hysterically the next! Well that’s mutual Jenn, you know that! Thank you Victoria, I love your organization and would hope to be able to visit one day! Julie, I think you will reach alot of your goals for 2012. As to the wedding dress, gee I can’t fit my size 9 dress – just impossible. I guess I need some fitness goals. Keep it up girl!